UNITED NATIONS, January 11 -- With Darfur the topic in the Security Council on Wednesday morning, some were surprised that Sudan's newly independent neighbor South Sudan spoke in the open meeting. Later it made sense: Sudan's Permanent Representative Daffa-Alla Elhag Ali Osman used part of his long speech to accuse South Sudan of sheltering the Justice and Equality Movement rebels and "seventy nine four by four" technicals. Afterward Inner City Press asked South Sudan's representative David Choat about the charge and he denied it, saying that Security Council members too know it is not true. But the Council went behind closed doors after the three speeches. Thus, after Daffa-Alla Elhag Ali Osman said that JEM had been supported by Gaddafi and left Libya after the regime fell, there was no public response from any Council member about International Criminal Court indictee Omar al Bashir's recent trip to Libya. Libya's new leaders' ambivalent relationship with the ICC seems to a topic on which loud ICC supporters like France do not want to speak. Inner City Press asked David Choat about South Sudan's oil dispute with Khartoum. "This is not the forum for oil," he said. While Choat kept his speech short, Daffa-Alla Elhag Ali Osman went long, even stopping to criticize a "Secretariat official" for having a "side conversation" and not listening to him. 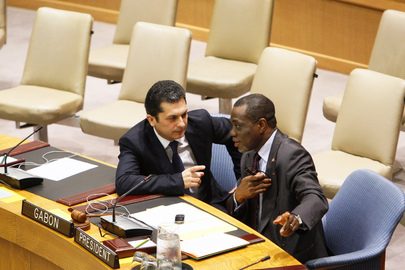 Afterward a range of attendees said the jibe was directed at the director of Security Council Affairs, Movses Abelian. A person close to the incident said that this month's Council president had, as frequently happens, asked the head of Security Council Affairs and his staff a question, and was getting an answer. Two Council Permanent Representatives told Inner City Press that Daffa-Alla Elhag Ali Osman's criticism was "ridiculous." With the number of diplomats using their BlackBerries -- if they work -- during Council meetings, to call anyone out is decidedly bad form. But as Daffa-Alla Elhag Ali Osman made, make peace or be punished. Watch this site.